Bhakri is a type of Indian flat bread that is thicker and crispier than other flat breads. My mother-in-law taught me how to prepare these since my husband loves to eat them in breakfast. It is really not difficult to make and we like to make it on weekends and serve as brunch. If serving as breakfast/brunch, it is best to be served with Gur Kari (Gujarati Sweet Mango Pickle), some fried or grilled fresh chili, or chili garlic chutney and Chai. It can also be served as lunch or dinner if paired with daal and some vegetable dish. In a bowl, combine flour, salt, cumin seeds and oil. Mix with hands until oil is incorporated into flour. When you take a handful of flour and form a fist, the mixture should hold its shape. Add water, little at a time until the dough almost comes together. Knead the dough for a minute or two until everything comes together and can form into a dough ball, adding more water if required. This is not soft dough so it won't be very smooth but should be in one piece without falling apart. Preheat a skillet or clay pan over medium heat. Divide the dough into 4 equal portions. Take each portion and with clasped hands, squeeze the dough between your two palms, pressuring on the edges while rotating the dough to form a smooth disk-like shape. Shape all four pieces. Take one shaped piece and with rolling pin, roll into a circle about 6 inches in diameter and approximately 1/8 inch thickness. It is normal if the edges are not very smooth. Place the rolled out dough on the skillet and cook for 1 to 2 minutes per side until some brown spots appear. If using gas stove, take the cooked Bhakri with a kitchen tong and place it over direct fire over medium heat. Rotate and flip few times and cook over direct fire for 20 to 30 seconds to get more color. If not using gas stove, just continue cooking on the skillet till it is cooked through. 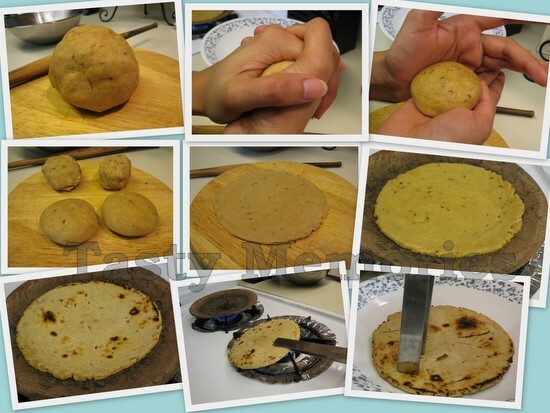 Place it in a plate and with a sharp edge kitchen tong or spoon poke some areas of Bhakri so that ghee can penetrate. Coat the back of a small spoon with ghee and spread it over the Bhakri evenly. Repeat the rolling and cooking process with the remaining dough and serve either warm or at room temperature with chili garlic chutney (recipe below), Gur Kari(Gujarati Sweet Mango Pickle) and Chai. Note: To save time, while you’re cooking one Bhakri work on rolling the other. Process jalapeno and garlic in food processor until fine or chop it up with knife very finely. Transfer to a small bowl, add oil and salt. Mix it up and serve.